How can you trust a man that wears both a belt and suspenders? Man can't even trust his own pants. 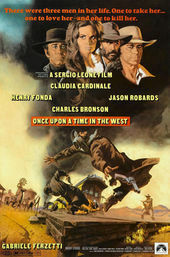 Acting as a farewell of sorts to the famous Dollars Trilogy and as one of the most memorable character entrances in film history, the opening of Sergio Leone’s Spaghetti Western opus Once Upon a Time in the West (C'era una volta il West) is a masterwork of blocking, composition, editing, and sound design. At over ten minutes in length, the nearly silent opening sequence centers on three gunslingers – Stony (Woody Strode), Snaky (Jack Elam), and Knuckles (Al Mulock) – and their arrival at Cattle Corner, an isolated train station somewhere in the Old West. Their purpose is a mystery, but their rough treatment of the locals and general demeanor speak volumes: they’re waiting for someone, and when he arrives it’s not going to be pretty. Filmed over four days in La Calahorra, Spain, the opening sequence, like the rest of the film, was shot without sound so that dialogue and effects could be dubbed in during post-production. This was standard practice in Italian films of the era and gives Once Upon a Time in the West that classic Spaghetti Western feel. 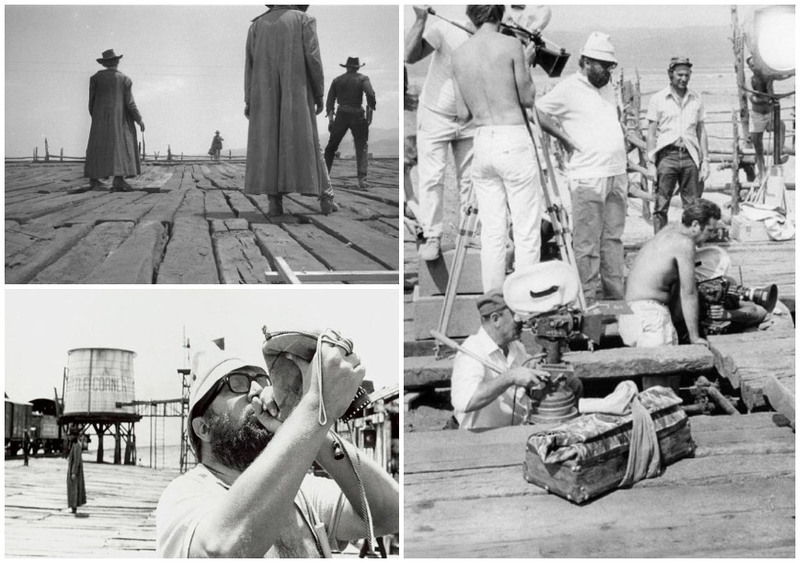 Image set: Director Sergio Leone and crew shooting the Once Upon a Time in the West opening in La Calahorra, Spain, 1968. But why three gunmen? Leone is rumoured to have offered the gunslinger roles to actors Clint Eastwood, Lee Van Cleef, and Eli Wallach – the stars of his previous Spaghetti Western hit The Good, The Bad, and the Ugly (1966). The opening of Once Upon a Time was intended to be a passing of the torch from the Dollars Trilogy, setting the stakes early with bullets and blood. However, when Eastwood declined, the director scrapped the idea and hired veteran Western actors Strode, Elam, and Mulock instead. 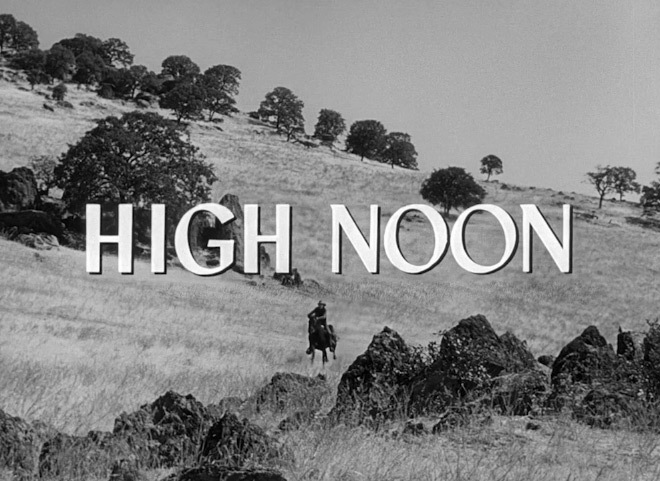 The opening bears a striking similarity to another Western, director Fred Zinnemann’s High Noon (1952), which also opens with a trio of ne'er-do-wells (one played by Van Cleef) waiting for a train. Often imitated but never surpassed, the influence of Once Upon a Time in the West’s iconic opening is still felt to this day. Director Quentin Tarantino opened his 2009 film Inglourious Basterds with a sequence entitled “Once Upon a Time in Nazi-Occupied France,” introducing the movie’s primary villain in a similarly slow scene culminating in bloodshed. Leone himself drew from a number of classic Westerns to construct West’s title sequence, including John Ford’s The Iron Horse (1924), which contains a nearly identical low angle shot of a train rushing towards the camera. In West, Leone uses sound and editing to slowly ratchet up the tension as the trio wait and wait and wait for their quarry. The film’s score is widely considered to be some of composer Ennio Morricone's finest work, but the only sound here is the squeak of the wind turbine, the jangle of spurs, the cracking of knuckles, and the incessant buzz of one seriously pesky fly. This naturalistic soundscape allows the credits, set in Cooper Black, to seamlessly blend in with the scene. On-screen moves and audio cues pull – or lasso, if you will – most of the typography into frame. Credits appear and disappear in time with the clack of the telegraph machine or the slamming of a door. The final credit of the sequence – Directed by Sergio Leone – arrives with a roar as the long-awaited train pulls into the station, the type coming down across the tracks to block the locomotive’s path or, more appropriately, like the arm of a clapper board. The showdown is about to begin. Action.